On Friday, 31 October, C-SPAN held a thirty-minute interview with Socialist Party Presidential Candidate Brian Moore. The interview is now online and can be found here. "Last night Stephen Colbert quite cleverly invited the actual Socialist candidate for President onto his show, to give him the opportunity to state the blindingly obvious: Obama's no Socialist. (Added bonus was hearing a real, actual socialist explain his philosophy on national television. That doesn't happen very often)..."
"There is a Socialist candidate on the ballot in eight states, and it's not Barack Obama. His name is Brian Moore, resident of Spring Hill, Fla., whose resume includes training at a Franciscan seminary, a stint in the Peace Corps and work in health-care consulting..."
"Obama's no socialist, says Brian Moore, the nominee of America's honorable old Socialist Party. "BROOKSVILLE -- Brian Moore, the presidential candidate from Spring Hill out to prove that socialism isn't a dirty word, is slated today to face what could prove to be his toughest interviewer yet: Comedy Central's Stephen Colbert. Moore will appear on The Colbert Report tonight to talk about his candidacy at the top of the Socialist Party ticket. The show airs at 11:30 p.m. and the episode will air again Wednesday at 10:30 a.m. and 2:30 and 7:30 p.m..."
Socialist Party Presidential Candidate Brian Moore appeared on Comedy Central's Colbert Report on Tuesday, 28 October, to discuss socialism and his campaign. You can watch the interview online here. BRIAN MOORE WILL BE ON COLBERT TONIGHT! 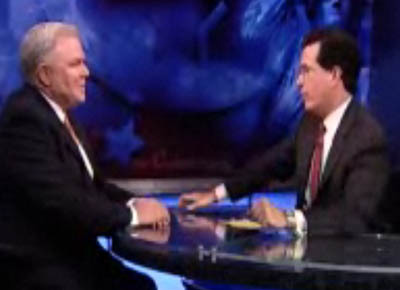 Brian will appear tonight on the Comedy Central show The Colbert Report, which begins at 11:30 pm EST. Brian was flown out to New York by Comedy Central for today's taping and airing of the show. While in New York for tonight's Colbert Report episode, Brian will also be doing an hour long interview by telephone on the "Fight Back with Dr. Bob Fitrakis" radio show on WVKO 1580AM -- Ohio's Progressive Talk, beginning at 5 pm. "The only Board of Education candidate not playing back this mantra is Dwain Reynolds III, a 22 year old from the Socialist/Green party, who also advocates the abolition of all charter programs and tuition for higher education...."
If you enjoy your freedom, thank a protester; thank a dissident, because dissent protects democracy. Be it a stingy two-party democracy, it is still better than a really stingy one party totalitarian state. False patriotism, flag waiving and unquestioningly supporting your government is not defending freedom, it's opening doors for fascist minded folks to eliminate our freedoms right from under our collective nose. "It is almost ironic that when journalists and columnists, and I must admit I too am guilty of this, mention the lack of coverage that third party candidates like Independent Ralph Nader and Libertarian Bob Barr receive while in the same breath forgetting to mention the other third party candidates that are out there. Here are the other candidates that are likely to appear on your state's ballot on November 4 and what they bring to the table. Because are are just too many to discuss, this list will feature candidates who appear on the ballot in ten or more states in order of how many states they appear, including write-in options..."
Obama is a Socialist? Another "Known-Unknown"
"Ever desperate, John McCain has lately taken up an attempt to re-brand Barack Obama from blue to red. Obama, it seems, is a stealth "socialist." Or, so says Sarah Palin, or Joe the Plumber, or John McCain, or was that Bill O'Reilly? Remember now we are talking about a political crowd dedicated to "preemptive war" - they know something when they do not see it. Or, as Don Rumsfeld so eloquently termed it, Barack Obama being a socialist is a "known unknown." Unfortunately for the McCain campaign, a large chunk of the American electorate, despite eight years of presidential idiocy, has managed to retain some amount of rational reasoning. By any reasonable measure Obama is far from a socialist. Let's look at three..."
"Spring Hill, Florida - In the maze of political signs you see along the roadways these days, one you're unlikely to find is "Brian Moore for President." They are few and far between. The cluttered office of Moore's Spring Hill home is headquarters for his presidential run. The long-time civic activist is the candidate for the Socialist Party USA. "We can offer a viable alternative," says Moore..."
"Barack Obama and John McCain have been called socialists for their support of the bailout. But Moore, the Socialist Party USA's presidential nominee, really is one, and his feelings are hurt. With all the accusations of socialism flying around, it seemed like a good time to check in with Brian Moore, the Socialist Party USA presidential nominee. As Moore himself observed, socialism has been in the news more in the past few weeks "than anytime since 1932." Over the course of two recent afternoons, I conducted a hard-hitting phone interview with the 65-year-old candidate who spoke to me from his home in Tampa, Florida, and from the Fox News green room, where he was preparing to tape one of his recent Neil Cavuto interviews. What follows is a condensed version of our conversations..."
Brian Moore on Fox News show "Your World with Neil Cavuto"
"Spring Hill -- Brian Moore said Barack Obama is not a socialist. And Moore should know. He's the Socialist Party USA candidate for president..."
"But the Democratic presidential nominee apparently doesn't have the backing of Kaniecki, who at one point repeated 'Moore, Moore,' for Brian Moore, the Socialist Party USA candidate for president. 'He's not really for peace,' Kaniecki said of Barack Obama. 'He's really for shifting the focus of the war (to Afghanistan) instead of ending the war.'" 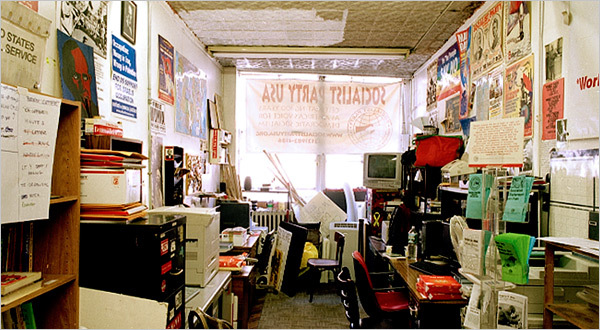 "The Manhattan office of the Socialist Party USA, where a constant stream of printed material is produced. "If there's anything normal around here, it's folding papers and stuffing envelopes," said Zelig Stern, secretary of the New York chapter..."
Matt Erard, Socialist/Green candidate Michigan State Representative in the 53rd District (Ann Arbor), was interviewed on WJR News Talk 760 in Detroit on Monday, 20 October 2008. Erard appearead on the right-wing Frank Beckman morning show, which is #1 in Detroit radio aribtron ratings during the time it airs. In addition to debating with Beckman, he also took calls from a few WJR listeners. WJR has the largest broadcast range in Michigan, with strong reception in all of Southeastern Michigan and northern Ohio. Mitt Romney followed Erard as Beckman's next guest. You can listen to the interview online here. Erard's 2008 campaign Web site is at www.Erard2008.org. "Under a Moore presidency, he said, there would be a massive redistribution of wealth and nationalization of key industries such as energy and the airlines. No worker would earn more than 10 times what another worker makes, Moore said. Socialism, he said, has a history of fighting for things that the mainstream used to oppose, such as child labor laws, women's suffrage and a 40-hour work week..."
I urge all of our Socialist Party members to get out and vote, early, if possible, to avoid any problems on election day. Voting on principle, instead of for power, is our all-important obligation, and that principle is for a radical systemic change in our economic system. Send a message, loud and clear, that you are not happy with the status quo, nor with our present destructive capitalistic economic system, and that the two mainstream political parties are not offering any choices for the American people. The 2008 General Election is only days away and millions of voters will have two choices to make: capitalism or socialism, and the voters' choice for leadership will determine the destiny of the U.S. and world economy well beyond the next term of the U.S. president. Socialist Party Presidential Candidate Brian Moore talks with Scooter McGee about his FoxNews appearance on Neil Cavuto. Why is FoxNews talking now about Socialism? How is a Socialist Candidate treated by the "Lame Stream Media?" Why was Brian interrupted repeatedly? Learn the answers to these questions and more about Socialism tonight starting at 9pm MT! You can for the first time Watch the Show by clicking the link..."
A video of the locally televised two-candidate debate between Socialist Party State House candidate Matt Erard (53rd district - Michigan) and Democratic Party incumbent candidate Rebekah Warren is available online. The video can be viewed at this link. "Brian Moore, Socialist Party USA: Moore waged several unsuccessful bids for mayor and city council in Washington, D.C., and twice ran for the U.S. House of Representatives from Florida's Fifth Congressional District.... The party's principles and platform call for the elimination of the power of big business through public ownership and workers' control, production for use instead of profit, and the establishment of a classless society. The party is also strongly committed to internationalism and the struggle against racism, sexism, classism, heterosexism and homophobia. The party calls for the abolition of the death penalty and for the replacement of the prison system with restorative justice..."
The Coalition for October Debate Alternatives (CODA) hosted a debate on Monday, 6 October, open to all third party candidates for president as well as the major party nominees. The candidates who attended include Brad Lyttle of the U.S. Pacifist Party, Charles Jay of the Boston Tea Party, Gloria LaRiva of the Party for Socialism and Liberation, Frank McEnulty of the New American Independent Party, Darrell Castle of the Constitution Party and Brian Moore of the Socialist Party. Bruce Barry, professor of sociology and professor of management at the Owen Graduate School of Management at Vanderbilt, was the moderator. A recording of the debate is now online and can be watched here.